CheckMarket has made some standard themes available with which you can easily and quickly change your survey’s appearance. You can, of course, also manually change your survey’s appearance and afterwards save this design as a theme so you can re-use it later for other survey projects. Click on Settings and then select Appearance. 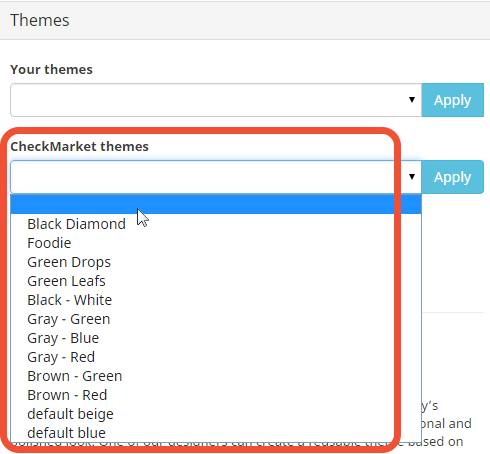 In the Themes menu select the desired theme from the drop-down list CheckMarket themes. The selected theme has now been added to your survey. You can check this by going to your survey’s Preview version. If you want, you can still make adjustments via the other options under the Appearance menu. You can also create your own personalised appearance for your survey and afterwards save this design in order to re-use it later for other survey projects. Open the survey whose design you wish to re-use. Click on Settings and then click on Appearance. Give your theme a name in the pop-up screen. You will find your personalised theme back in the drop-down list Your themes. In the Themes menu select the desired theme from the drop-down list Your themes. Click on the button Apply. The selected theme has now been applied to this survey. When you click on Preview you can check the result. If you wish you can still make adjustments to this theme via the other options in the Appearance menu. These additional changes will not be saved automatically to the selected theme. You need to repeat the steps as described above in order to do so. When you use our Custom design service, this custom design will be set as default for all of your new surveys. Additionally the custom design will be saved as a theme. That way, if you’ve made changes to the survey appearance, you can always select the custom design again. 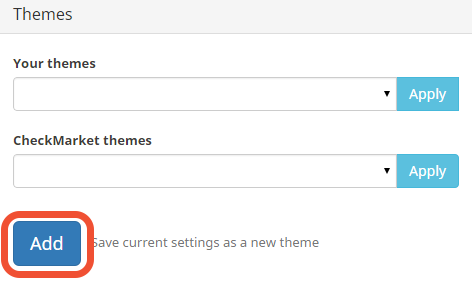 In the Themes menu you select the theme you wish to remove from the drop-down list Your themes. The selected theme has now been removed and can no longer be selected in the list.